Georgia Lawyers for the Arts (GLA) exists to serve the legal needs of artists and arts organizations, to promote closer contact and understanding among members of the legal profession and the arts community, and to educate artists about their legal rights and responsibilities. 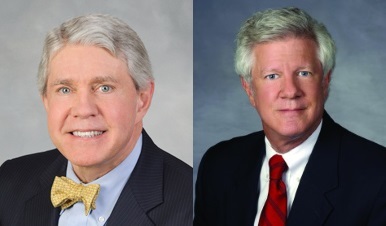 Benjamin T. White (left) and Robert C. Lower (right), attorneys with the law firm of Alston & Bird, founded Georgia Lawyers for the Arts in 1975. For over 40 years, GLA has used its network of volunteer attorneys to provide free legal assistance to musicians, songwriters, photographers, sculptors, dancers, filmmakers, painters, actors, and artists from many other disciplines who would not otherwise be able to afford legal representation and counseling of their rights. Over 1,000 lawyers volunteer their time for GLA. Common legal issues involve securing copyright protection, cases involving idea misappropriation, artists negotiating with galleries, and reviewing recording, publishing and licensing agreements. Many attorneys also volunteer through GLA’s Georgia PATENTS program to assist inventors with the patent filing process. This past year, GLA provided more than $2,000,000 in pro bono legal services to artists and arts organizations. GLA also makes referrals to experienced attorneys for artists and arts organizations that do not qualify for free legal services. GLA has helped hundreds of nonprofit arts organizations obtain tax-exempt status. Since our inception, GLA has served several thousands of artists and arts organizations across the state of Georgia. GLA provides access to its extensive research library and can provide free mediation services to members as a means of resolving artists’ legal disputes. In addition to providing pro bono legal services to limited-income artists, GLA conducts dozens of free or low-cost educational seminars and workshops for artists and arts organizations on numerous legal and business-related topics. In 2014, GLA established a separate program, Georgia PATENTS, to offer assistance to Georgia and South Carolina inventors. GLA worked alongside the USPTO to create and fund Georgia PATENTS. Georgia PATENTS helps solo inventors, non-profits, and small businesses find patent agents and attorneys to help draft and file patents on a pro bono basis. For more information about the Georgia PATENTS program and to fill out an application, click here. Georgia Lawyers for the Arts (GLA) is a nonprofit organization that provides legal assistance and educational programming to artists and arts organizations in Georgia. We offer educational seminars, seminars, a resource library full of form contracts and educational materials on a variety of legal topics related to the arts, and a network of over 1,000 volunteer and member attorneys. “Artist” is a broad term including musicians, songwriters, photographers, filmmakers, painters, poets, graphic designers, actors, theatre companies, dance troupes, museums, and artists from many other disciplines. If you are an artist or arts organization in need of legal assistance, please visit our Artist Membership Page to our membership benefits and fill out an application. You may also call GLA at 404-873-3911. Please visit our Events page for information on and to register for our upcoming events and seminars.